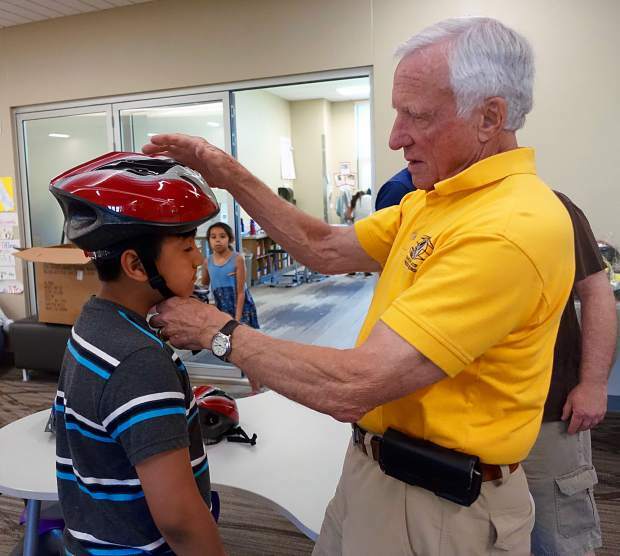 Karl Oelke fits a youngster with a new bike helmet as part of a Glenwood Springs Kiwanis Club project. 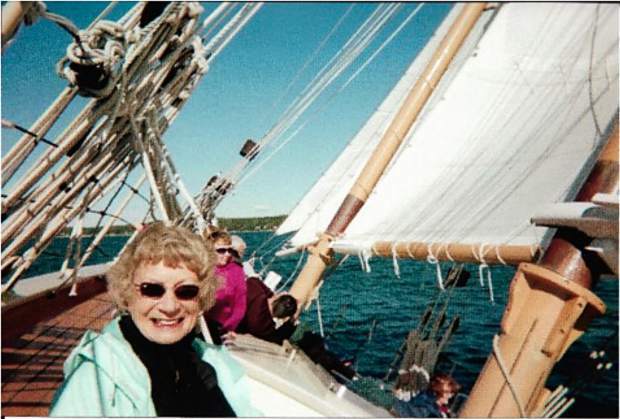 June Herrell on a sailing trip. Howard Stapleton, in his element. 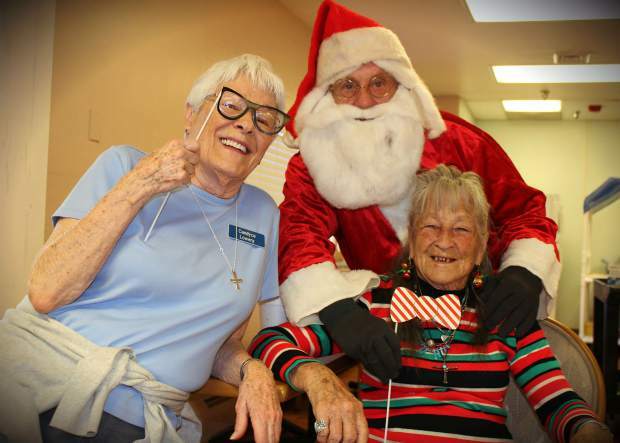 Betty Bendetti, with the striped tie, helping at a Rifle Veterans Home holiday event. Sonny Fernandez at the shop. 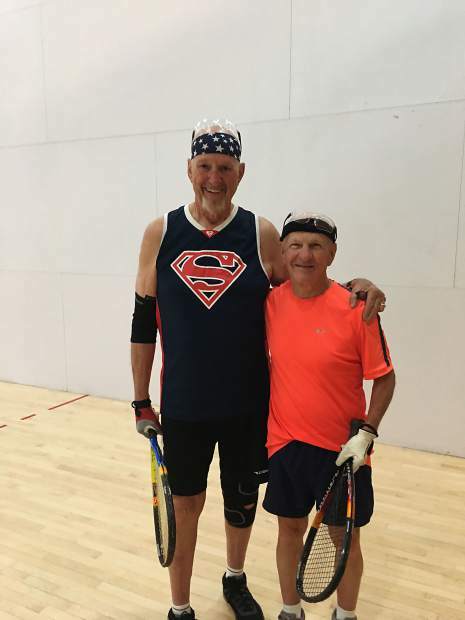 Lindel Silvertooth, right, on the racquetball court. Bob and Jane Lucas help at a past Spring Gulch Nordic trail work day. Why do Garfield County and Colorado’s mountain resort areas in general have among the highest life expectancy in the country? Speaker Tony Buettner, with the Blue Zones Project, provides science-based answers on Monday, Sept. 24, during the Glenwood Springs Post Independent’s “The Longevity Project” event at Morgridge Commons/Colorado Mountain College (above the Glenwood Springs Library). Doors open at 5 p.m.; program starts at 6 p.m. Tickets are $25, including food and beverages, and can be purchased online here. Editor’s note: Each Sunday through Sept. 23, the Glenwood Springs Post Independent will run profiles on the “Super Seniors” of Garfield County aged 80 and older who were nominated online by readers earlier this summer as part of our Longevity Project. 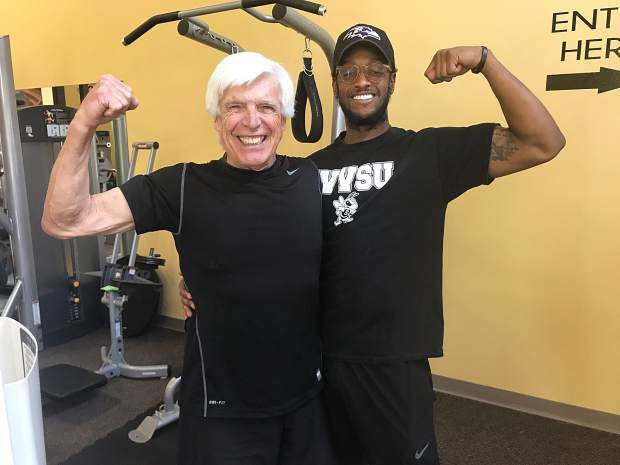 Engaged in community, positive, physically active, disciplined, family-centric — all words and phrases that describe Karl Oelke of Glenwood Springs. Karl is a very active 81-year old who leads a highly-disciplined, energetic life. He is a life-long learner and a life-long doer who leads by example, says his nominator. Karl is a West Point graduate who served his country for 31 years both active and reserve, notably during the Vietnam conflict. He completed a Ph.D. in English, and he taught at West Point for four years. After leaving active duty and joining the Army Reserves, he taught at a two-year college for 29 years. 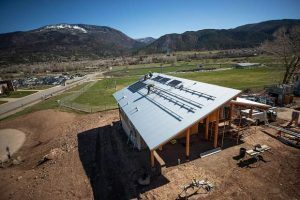 Karl and his wife Sue came to the Roaring Fork Valley in 2006 to retire to this beautiful locale and join friends from their earliest military days. Karl is an involved community member. He joined the Kiwanis Club in 2008 and served in various leadership positions, including president from 2012 to 2013. He worked with the Glenwood Springs High School Key Club for seven years, inspiring high school students to develop leadership and volunteerism, in addition to their academic goals. He led the Kiwanis Scholarship Committee that awarded scholarships to graduating seniors from Glenwood Springs and Basalt High Schools. Currently, he is Club Secretary, one of two non-dues-paying positions owing to its demanding workload. Along with his other responsibilities, Karl is in charge of jokes at the weekly Kiwanis meetings; he always brings a laugh. In another demanding position, Karl currently serves as Clerk to Session in the First Presbyterian Church in Glenwood Springs. This position is central to the running of the church. In the past, he was a Ruling Elder, one of the leaders of the church. 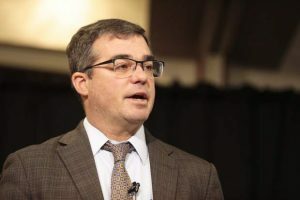 He also is serving on the search committee for a new pastor. Karl is an avid student of the Bible and leads a Bible study discussion every Wednesday evening during the academic year. Karl enjoys exercise and sports. He loves skiing and is highly competitive, and he tries to best his ski buddies for the most number of runs per day and the most number of days skied each season. Every year he skis one week with his West Point friends. They used to visit a different ski area every year, vowing never to ski the same place twice, until they came to Snowmass. After one disappointing year at Park City, Utah, they now ski only at Snowmass. During the summer, Karl bikes with friends and walks his dog, Pepper, daily. Karl is a devoted family man. He temporarily put on hold his outdoor activities to care for his wife of 59 years, who recently passed. His loving sons and grandson, who attended the memorial service, are a testament to the strong family ties. Jeanne (June) Herrell just turned 87 in early September. June plays ping-pong at least once a week, works out with a personal Pilates trainer once a week, walks the Glenwood Springs bike path whenever weather and her schedule permit, and exercises with stretching and core work every night before bed. She also walks several miles every Wednesday in her capacity as a volunteer at the Cancer Center in Valley View Hospital and loves to play air hockey when she can find a table. 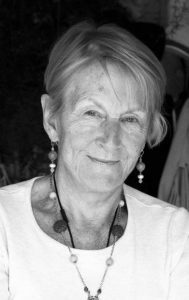 To exercise her mind, June loves board games, particularly Scrabble, reading novels, magazines and Bible studies, traveling locally, nationally and internationally, and trying to beat the contestants on Jeopardy. June is a strong Christian and credits God and her faith with her health and longevity. She is active in her church and helps with their program to feed the homeless in Carbondale each month. She is a decades-long member of the PEO, a women’s philanthropic group dedicated to helping young women, and has been active throughout her life in faith-based charitable groups. “It is not the world around you, or what is going on in your life, it is up to you to decide every single day whether to be happy or sad,” says June herself. Howard Stapleton does it all. He drives a bus for RFTA. He loves pickleball, skiing and playing tennis with his lovely bride Margo. “Howard weight trains with me at Midland Fitness to keep up with all of his activities,” said Vincent Caprio, Howard’s trainer. Watching 4-foot-9 Betty Bendetti in action as she volunteers for the Veterans Community Living Center at Rifle reminds you why your mom always said not to judge a book by its cover, writes Betty’s nominator. “At 93 years old, she remains fiercely dedicated, full of energy, and embodies the kind of ‘don’t take no baloney’ attitude that has become increasingly rare nowadays,” she says. Growing up on Hunter Mesa in Rifle, then Betty Bradley attended a one-room schoolhouse with her brother and just one other classmate. Following her graduation from Rifle High School in 1942, she married, had three sons, two daughters and worked at various Rifle businesses for some time. It wasn’t until reaching the ripe young age of 70 when Betty made her grand entrance into the healthcare industry. By 75, she had earned her Certified Nursing Assistant License, and continued building a career with the VCLC at Rifle that would span almost two decades. Now in her retirement, Betty volunteers at the facility during special events and twice weekly as part of a two-woman team; serving ice cream to residents with her friend Candyce Lowery of Silt. You will not find a bigger-hearted guy, or one who is more willing to give you the shirt off of his back than Sonny Fernandez. If you need it, he will help you out in a thousand different ways. 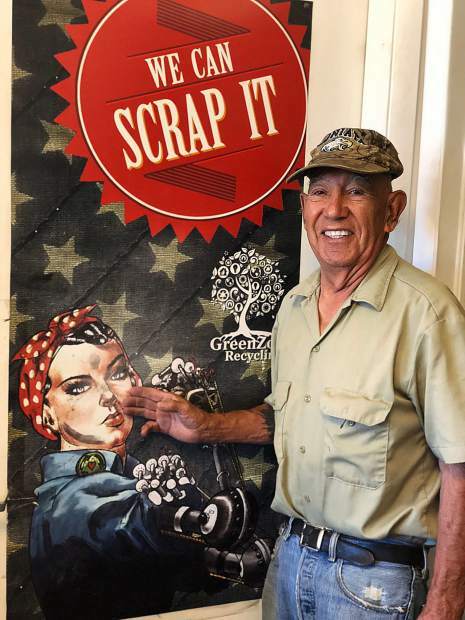 We are lucky enough to have Sonny’s full-time help here at our Green Zone Metal Recycling business in Silt. He not only works full time for us, breaking down metals every day, he is also a faithful provider of cheerful attitudes and inappropriate jokes. Furthermore, Sonny cannot be outworked by even the youngest, most energetic employees in our business. His work ethic is second to none. In addition to full-time employment, Sonny also regularly helps his neighbors with their gardens and yard work, takes care of stray animals, participates in local schoolhouse dances and senior lunches, and volunteers his time to help anyone in need. Sonny is a Silt native who grew up mastering the hard work of farming, and sheep and cattle ranching. He is a rich resource for local history, and one who could sit and tell you stories for hours. He is currently working on a book that will contain many of his stories, and much of this history. Sonny also served 20-plus years in the U.S. Navy as a sonar technician. We cannot think of a more worthy candidate for this Super Senior award, or for any super citizen award for that matter. This valley is extremely blessed to have an upstanding citizen like Sonny. Lindel Silvertooth knows no strangers, according to his nominator. 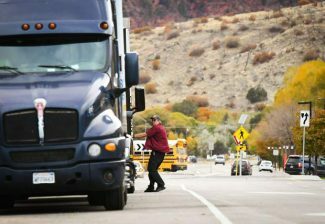 He has been president of Glenwood Springs Lions Club twice. He also was District Governor for Western Colorado. • Helps with the Extended Table meals at the Methodist Church, and delivers meals each month at the Manor apartments. • Is a positive influence on everyone he meets. Bob and Jane Lucas have been active in Carbondale for many years. Jane is in her 80s and Bob is in his 90s now. They still ski and hike. They often can be seen at the Carbondale Recreation Center. They are very active with Spring Gulch and have invested a lot of time and energy in the cross country ski area. “Bob and Jane are a phenomenal couple,” writes their nominator. 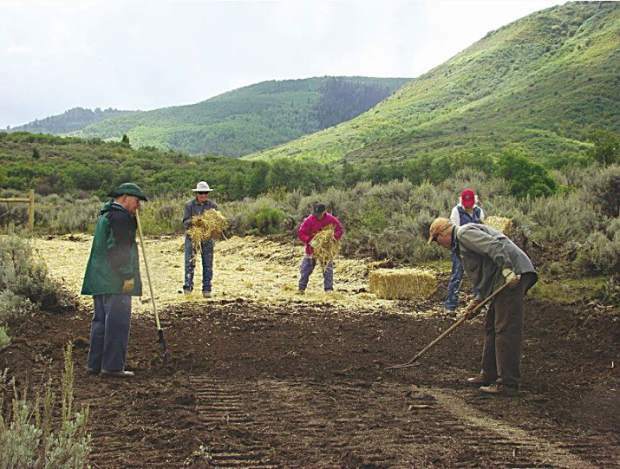 The accompanying photo from the Glenwood Post Independent newspaper dated Nov. 17, 2011 shows Bob and Jane Lucas working on the Spring Gulch ski system.